Sustainable Solano is a grassroots, county-wide movement uniting people and their initiatives aiming to serve the future of Solano County, to promote ecologically sustainable, economically and socially just communities. The organization had been expanding its mission of sustainable gardening since 2011 to include all forms of sustainable local food production (urban agriculture, permaculture, wise water landscape practices, Community Supported Agriculture partnerships and public education). 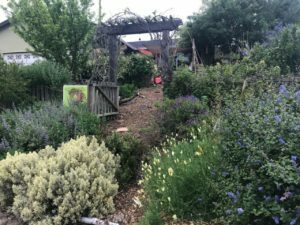 Benicia Community Gardens changed its named to Sustainable Solano in 2016 to reflect its current scope and growing reach to actively engage all of Solano County. Sustainable Solano provides opportunities to local community members across the county to participate in four main initiatives: sustainable landscaping, local food movement, a community conversations speaker series and a sustainable neighborhoods pilot expanding on the sustainability framework to include renewable energy and shared small local solutions. Since 2016, its programs have extended to Vallejo, Fairfield and Suisun City. Sustainable Solano will be launching its Sustainable Backyard program in Vacaville this August bringing educational, hands-on learning opportunities for residents interested in sustainable landscaping and wise water landscape practices to feed a landscape. This program focuses on transforming lawns and unproductive landscapes into lush, food-producing gardens fed primarily by secondary water sources (laundry-to-landscape greywater system and rainwater) and also brings inspiring talks on sustainable landscape design and permaculture principles. The Vacaville Sustainable Backyard program will launch on August 11, 2018, with a talk by the permaculture expert Lydia Neilsen at Morningsun Herb Farm in Vacaville. The application period will be open to Vacaville homeowners and community public spaces to apply to become “food forest keepers” and have their yard transformed into a demonstration food forest garden. Highly visible, front-yard lawns are preferred but other types of landscapes (up to 2,000 square feet) are welcome to apply. Details about this expansion and a downloadable application will be available on the website homepage from August 11-September 21st. Sites are assessed and chosen by Sustainable Solano’s Advisory Board made up of dedicated residents aiming to raise sustainability awareness in Solano County. Site selections are based on criteria such as: yard access, greywater feasibility, sun orientation and a commitment to community education. There is no financial cost to Vacaville homeowners interested in being a part of this community-building project. The program will offer a series of free, hands-on public educational workshops where locals can learn about permaculture design and be part of the installation of these edible ecosystems fed by secondary water sources. There will be an annual tour of these demonstration food forest gardens. This project is made possible by the funding and support of the Solano County Water Agency. The Sustainable Backyard will expand to Dixon and Rio Vista in 2019. Visit www.sustainablesolano.org and www.facebook.com/sustainablesolano for updates and details about this expansion. In addition to self-sustaining, water-efficient landscapes, Sustainable Solano also envisions an environmentally and economically sustainable local food system. In September of 2017, it was awarded a planning grant by the USDA to begin developing a business plan for Community Food Centers in all seven cities. These food centers will serve as a hub for local food activities: CSA deliveries, cooking classes, and community education increasing access to seasonal, locally-produced food, better health for residents county-wide and a stronger local food economy.